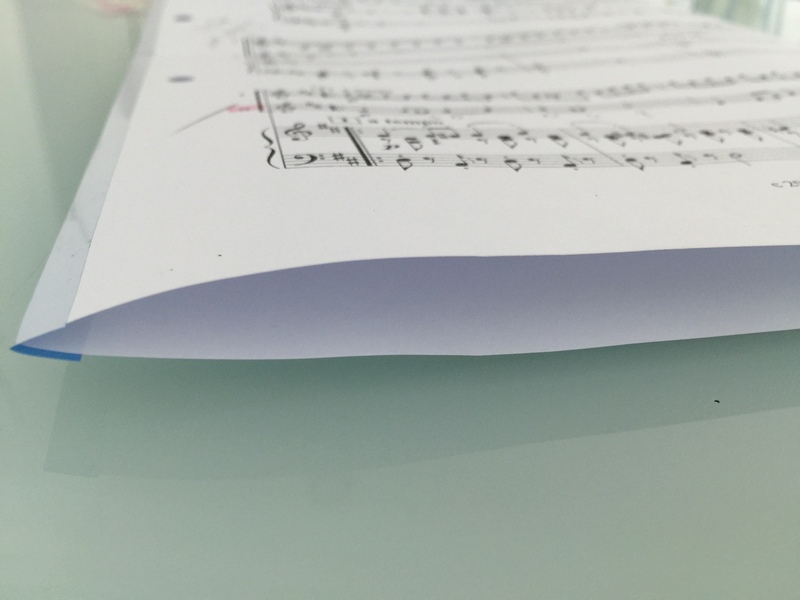 If you have dealt with loose sheets of music, you probably know that it can be a pain. Typically, we put them in files with clear pockets. But files with clear pockets are troublesome to use because every time the teacher needs to scribble something on the score, she has to take it out of the pockets. In the end, you still end up with pages of loose music sheets that you have to put back into the clear pockets after every lesson. Besides, the clear pockets tend to be quite reflective and the glare sometimes makes it difficult to read the score. The other typical solution is to tape the loose sheets together edge to edge such that you get one long piece. This is so that you can avoid turning the pages, which is troublesome when the pages are loose. However, this is only possible if the whole piece of music is contained within two to three pages. Anything more and you can’t place the whole thing on the music stand. One other way to overcome this problem of loose music sheets is to find a book of A4 size and glue the loose sheets to the pages. That way you get a book. Unfortunately, this method is not the neatest solution (unless you are really quite good at cutting and pasting) and you can’t remove the scores you do not need anymore. My #3 is learning the violin and many of the pieces that he plays come in the form of loose sheets of music, not in a book form. The pieces that he plays these days are also getting longer so they are typically more than 2 pages long. 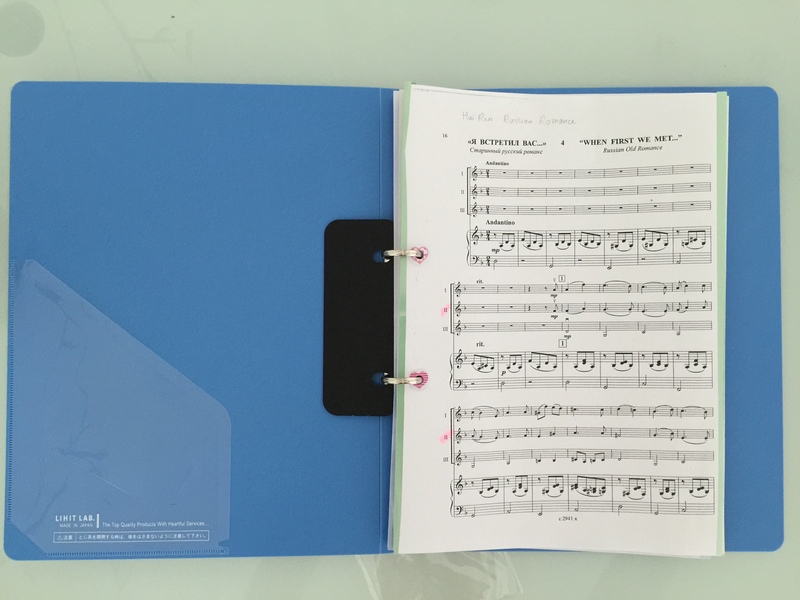 We used to use a clear pocket file to hold the sheets, but finally one day, having enough of all the problems associated with loose music sheets and clear pocket files, I decided to do something about it once and for all. First of all, I went to look for a ring file. A thin one as I do not expect to put too many scores inside. What is most important is that the file must be able to open up completely. I have used too many of these plastic ring files that were so hard that they would not open up completely and would not stay open. It would be hard to put such a ring file on the music stand. 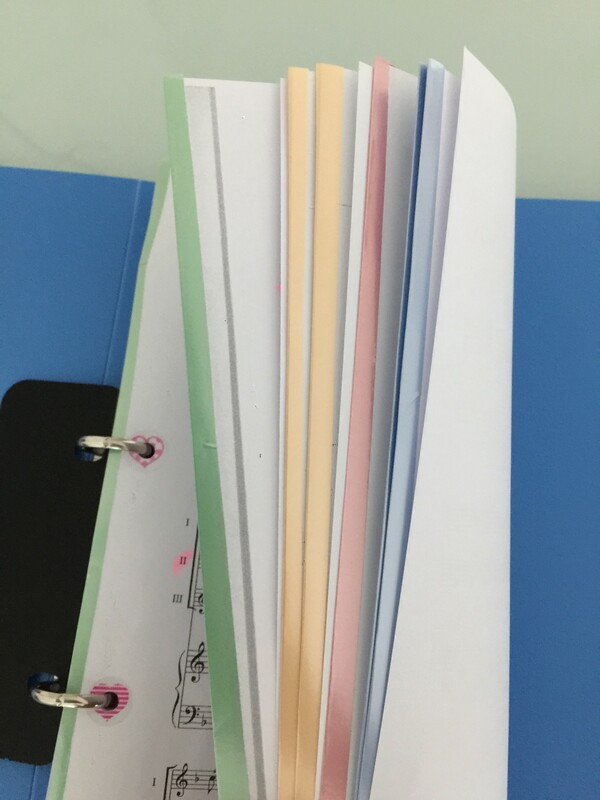 Next, I taped two consecutive pages of a score back to back with washi tape. I bought some plain coloured ones from Daiso. I only taped the two long sides and not the top and bottom (i.e. the width) of the sheets. I did so for all the pages. I used different colour tape for different music so that it would be easy to find the music and flip to the right page. The reason why I did not simply glue the pages back to back is because firstly, glue can be messy and the end result would not be neat; secondly, the tape gives a certain stiffness and thickness to the side so it helps with page flipping. Then, I punched holes in the sheets to put them into the ring file. Before I put them into the ring file, I pasted protective stickers over the holes so that the holes will not get bigger or even tear with repeated flipping of pages. I used cute patterned stickers that I also bought from Daiso. But for those parts where the sticker will cover the stave, I used transparent ones so that the music can still be read. So now, everyone is happy. The teacher is happy she can easily scribble on the score without the trouble of taking sheets out of plastic pockets. The kid is happy to be able to manage the sheets easily as well as not be bothered by the reflective glare of plastic pockets.